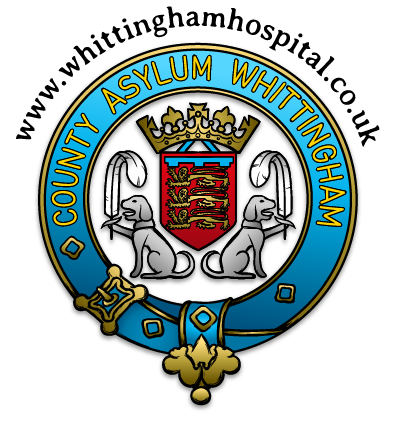 Well, at long last, all the pleading and all the shouting have come to an end, and so has Whittingham Hospital. The final buildings are in the last stages of being taken down, officialdom had razed Whittingham! Despite all our attempts at salvaging some part of the hospital, all entreaties were met with blank refusals. Even the attempt to get the Mains, the mains corridor and the Ballroom as listed buildings failed on the grounds that they were “insufficiently exceptional in their construct” and therefore did not warrant any form of listing status. The one remaining building on site is St John’s Church, which, happily is a Grade II Listed Structure. What will become of this building is anyone’s guess. There have been a number of suggestions for future use but so far nothing has developed. It should be borne in mind that the floor in the vestry has now given way and crashed through to the cellar which would give justifiable rise to the speculation that the remaining flooring would be unsafe. What has become of the tiled crest at the entrance to Cameron House? Who can say, no-one has been allowed access and we have no way of knowing if it has remained undamaged. What we do know is that all attempts to have this dug up and removed to a safe area, either the banking on the entrance at North Lodge or the gate entrance to the cemetery (preferable) have come to nothing. We are given to understand that building has commenced and some houses are going up at long last. This information is given at the time when it has been revealed that a patient from the Secure Unit had absconded and also that they drug keys had mysteriously disappeared! Not very encouraging for anyone wanting to buy a house there and live with, possibly, a young family. This however, is something we have maintained throughout. It is of interest to note that St Margaret’s, the newest of the divisions, equipped with two wards which had medical and surgical facilities built into the walls and a functional operating theatre, albeit a small one, was the first division to be greeted by the bulldozers. St Margaret’s has a history of nursing for the wounded military and civilians of the Second World War and then afterwards handled the overflow list for minor surgery from Preston Infirmary. As it was developed and ready for use one can but wonder why it was the first of the buildings to be pulled down. Speculate away! The cemetery continues to be monitored and we attend at regular intervals to ensure that things are as they should be. Additionally, we attend every Remembrance Day to lay poppies on the graves of the Soldiers interred there, both British and German. We will continue to honour their memory as Soldiers do and everyone is welcome to attend this small but fitting ceremony, each November. The dates will be published well in advance in case anyone would like to attend. The cemetery of course has not been missed in the rounds of demolition and the gates have been wrecked and one has disappeared altogether. Again, attempts to have the place tidied up, pathways edged and chippings placed there, came to no fruition, despite assurances that this would be done as a partnership venture between the one time English Partnerships and the Probation Service in Preston.